Crispy!!! Crunchy!! Melt in the mouth!! Delicious!! Rustic!! Irresistible!! Yummy!! are just some of the comments I have got from people when I have made these cookies at home :) I feel so blissful when I get such comments from them :) Cant ask for anything else in return. Yup thats a lot of butter, but you can skip some oil and cream for the next couple of days and indulge in these :P Your tongue needs to be treated royally at times too!! My funda is to bake with enough(Lots) of butter but eat less quantity. Don't compromise on taste to eat more. Two delicious cookies a day would do to satisfy your cravings. :) What do you say???? Sieve all purpose flour and baking powder together twice and keep it aside. Beat butter and sugar in a bowl until light and fluffy. Add essence and beat. Pour in 1 tbl spn of water at a time and beat until incorporated. Now add the sieved flour and baking powder mixture in three parts and beat in slow speed until it forms into soft dough. Now cover the bowl with cling film and keep in the fridge for 15 mins. Meanwhile preheat the oven to 180 c.
Crush the corn flakes in a blender or just with hands into small bits and take in a wide plate or bowl. Remove the dough from fridge. 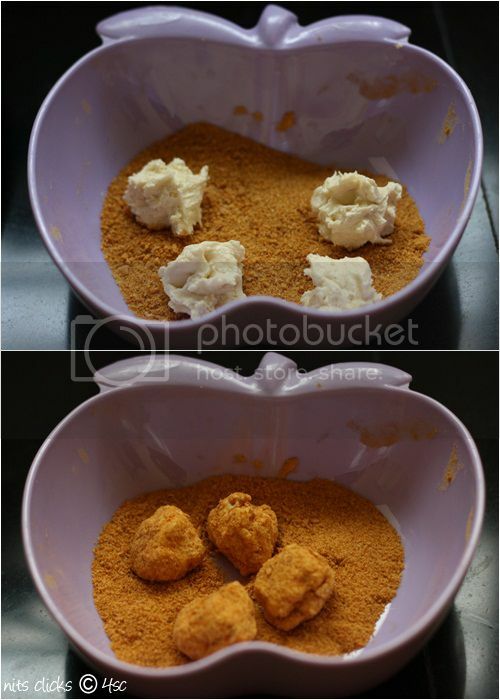 Wet your hands and pinch small portions of the dough and drop it on the corn flakes and roll until it is well coated. 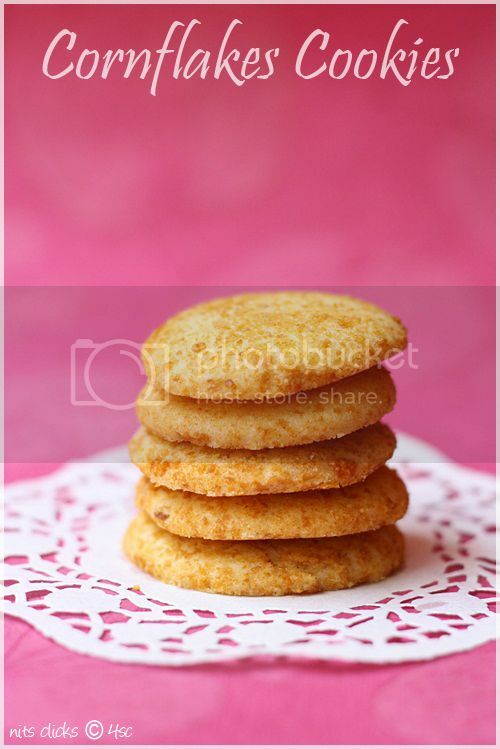 Flatten it using your palms and place on baking tray leaving 1 inch space between the cookies. Bake for 12 to 15 mins on 180 c.
It might be a little soft when the cookies are out of the oven, but it will become crispy and melt in the mouth kind once it cools down. They are truly delicious and im sure the eggless version tastes just the same. 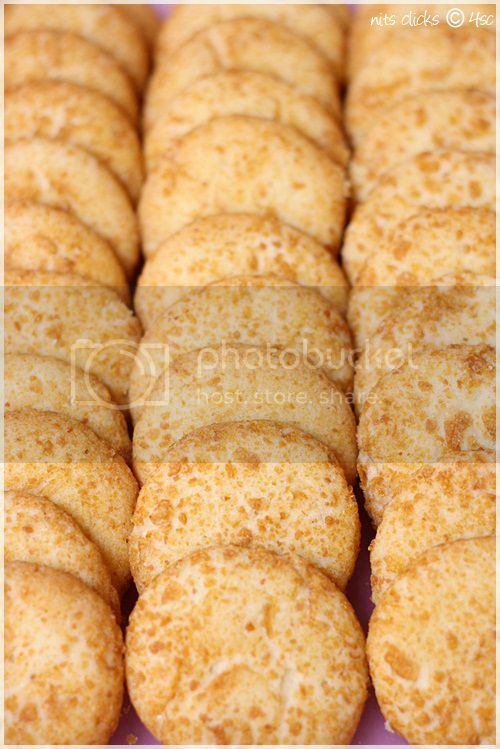 I love the pic where you ahve arranged all the cookies in a line..
wow. this looks so inviting. beautiful pictures. 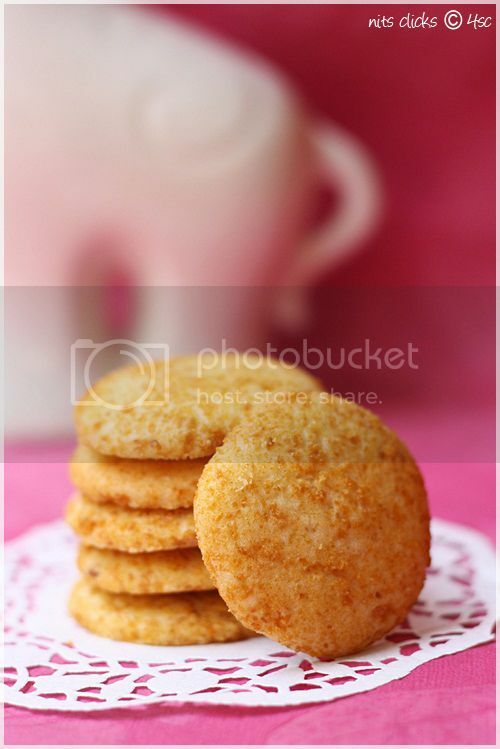 Delicious cookies to go for tea time treats! I agree with you. Dont Compromise on taste to eat more. Perfectly baked cookies. Looks delicious. 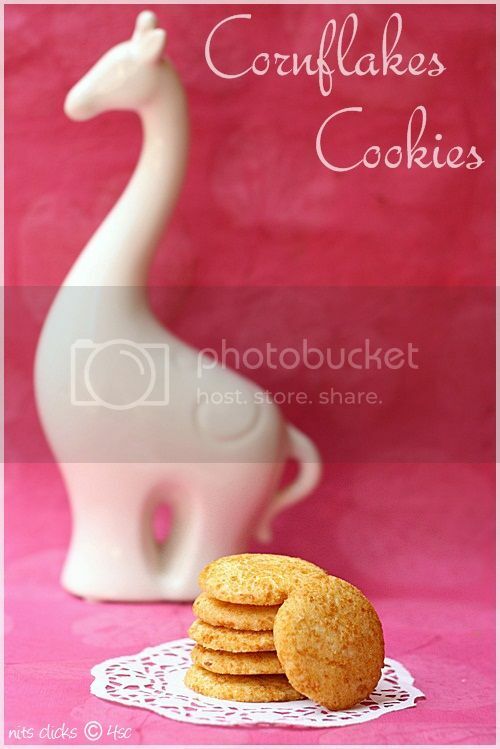 wow this is awesome idea to make cookies.....the presentation and the clicks rock dear! I really shouldn't have made these cookies. I can't stay away from them now! Can i use Microwave to make them in a healthy way. Wow! 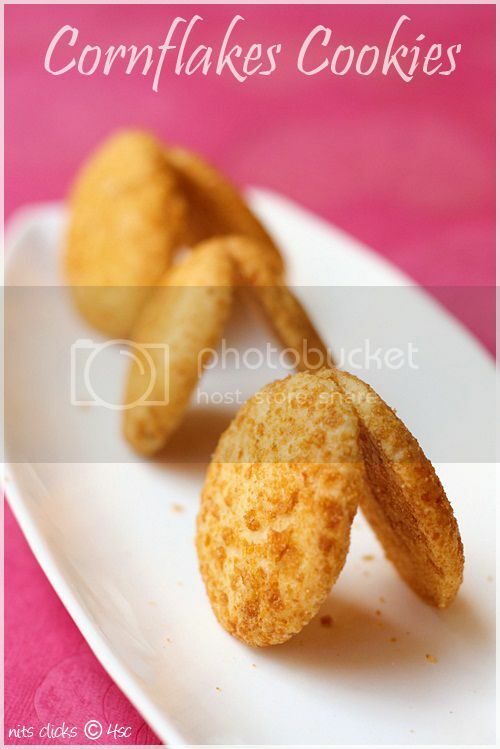 beautiful and very inviting cookies..love the pictures! You have a lovely space here with some lovely pics. Fabulous, the cookies looks so buttery delicious. I love the your thought of cooking with butter and controlling portions, now if only I could do that! I made a batch of cookies recently for my hubby and they paid up for all the problems caused by my doughy cupcakes.